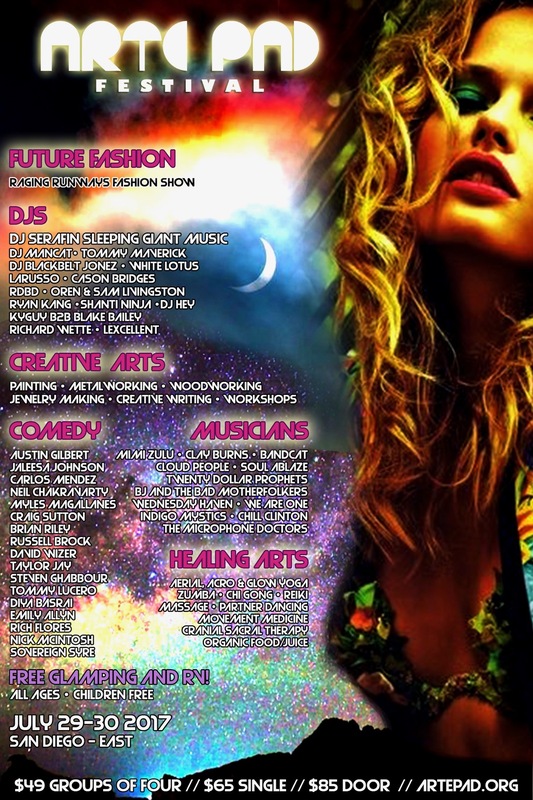 Arte Pad Festival is a fusion of DJ’s and musicians, creative and healing arts, a festival fashion show, performance art, and beer garden with comedians! It is an all inclusive, all ages event and even includes FREE GLAMPING (Glamorous Camping) on the property for tents and RV’s! DJ HIGHLIGHTS: International DJ Serafin of Sleeping Giant Music is headlining the show on Saturday night bringing dance, electronic, and hip hop mixes. San Diego’s Favorite DJ Mancat (resident DJ at Belly Up) and his brainchild Bandcat are spinning your favorite DJ hits mixed with live band on drums, guitar, and vocals! electric soul fusion as well as Verdell of Soul Ablaze bringing soul, reggae funk. Lots of variety include pop, hip hop, world fusion music, soul sound healing, and reggae. WORKSHOPS: Writing, jewelry making, Goddess Workshop (self empowerment, confidence building for the lovely ladies). BEER GARDEN will feature 15 + local San Diego comedians on both Saturday and Sunday! RAGING RUNWAYS FESTIVAL FASHION SHOW features models and designers from San Diego and Los Angeles showcasing swimsuits, jewelry festival attire, glowing creations, jackets, and accessories. Aerial performances will be going on during the fashion show! All designers will be vending at the event as well as other local artisans. Proceeds from the Festival benefit opening the 24 Hr Arte Pad in San Diego! Arte Pad is a non-profit organization that is best described as a 24 hr fitness for artists. Arte Pad houses the tools, resources and supplies for a colorful selection of arts, crafts, sewing, fashion design, welding, woodworking, music, healing arts and more! It’s our own artist-mansion/party pad open 24 hours a day in San Diego. Finally… a way for artists to continuously create and collaborate together… an alternative bend on partying without hittin’ up the club! The 24 Hr. Arte Pad Festival is your keyhole peek into the 24 Hr. Arte Pad…. We have a range of musical performances that range from reggae, electronic, soul, funk, pop, sound healing, trance, and dance! All creative and healing arts are included in the festival at no extra charge. Donations to artists and healers encouraged! Bring your own glamp setup and lounge area to relaxxxx in…. If you would like to set up directly on the festival grounds, setup time is Sat 7/29 from 7-11 AM. If you are unable to make those times, there will be an additional glamping area for latecomers (about a 5-10 minute walk to the festival). Why collaborate and unite your passions with other local artists at Arte Pad Festival? To have our passion spread wings and soar to new heights together! Tucked in the mountains of Jamul (30 min East of Downtown San Diego) lies 300 acres of nature’s finest untapped private property. Down falls 8.5 PH mountain water to freely drink, balance and awaken your energy systems with. Newly paved trails, landscape, trees, boulders, views, caves, and rare flowers blossom and bloom to the tune of summer love and creativity in the air. Cast your cares far from you and leave them for the good of the universe to swallow them up in eternal love. Arte Pad festival collaboration frees the willing of living independent lives. Lives of force, control, resistance, and being in the conversations in your head get left at the door. You have come to band together with artists. As you enter through the gates, you receive a cleansing and clearing ceremony to release and give up a burden you carry…. anything and everything that is keeping you from being present to the phenomenal journey ahead. Stepping within, you come to find the riches of creative wisdom and understanding, which draw out the deep waters from within the well of your heart. From nothing, in the present moment, united, and centered you create your possibility. Instead of fixing the past, you create your future newly from the present out of seemingly thin air. Is your possibility Love? Partnership? Peace? What ever you create it moves your heart with great inspiration in the present…. Creative collaboration beckons you to join the geniuses with the same passion in the uniquely designed interactive art camps…. Artists, welders, woodworkers, jewelers, and a wide range of crafters are hosting workshops and your gift makes it magic…. Meanwhile, DJ’s are spinning, musicians are performing, dancers are dancing, performers are engaging the crowd, comedians are making people laugh, children are playing on slip and slides and new found lovers exchange their first kisses of true love in their uniquely crafted love tent…. thus growing our love glow, ebbing and flowing through the ether. Just when you thought the hot summer loving heat would make you explode into happy bubbles, you discover Juice Pad haven serving fresh, local, organic juices, smoothies, salads, and frozen treats. Vegan, vegetarian, and various carnivorous smells waft through the air. You feel a sense of completion…. you are there, present, full of love, gratitude, strength, joy, home…. Eureka! You have found yourself in the beauty of being ONE with your creative body! As the morning moves in, you may choose to nap, sleep, cuddle, or continue dancing and flowing through the crowd. The music will go on to the deep house hours of the rejuvenated morning. As you arise with your nature glow, receive your soul shining in the crystal sound bowl healing, meditation journey, and the inspired, eternal word of life being spoken over you. We belong together in art paradise. See you in the vortex….